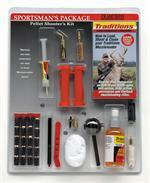 Traditions updated design is a safe, no-spill way to refill your powder flask. Brass Funnel with aluminum threaded spout to securly attach to openings of tubular style and Zouave style flasks. Fits most standard powder flasks. Also works well with our powder horn flasks with spout. New funnels are entirely brass and may not be as pictured.